I am now officially a Nebula Award winner! My immediate reaction was a snarky grin and I prepared to tweet a gentle correction. Everyone knows that the Andre Norton Award for Young Adult Science Fiction and Fantasy is not a Nebula. It said so in the Nebula Rules at the time I won the award (“14.a. The Andre Norton Award for Outstanding Young Adult Science Fiction or Fantasy Book, established in 2006, is awarded in tandem with the Nebula Awards. This award is not a Nebula, but shall follow all Nebula rules and procedures except as follows.”) Except that I am a pedant, and I wanted to check my sources before tweeting. So I checked the current Nebula Rules. And that phrase is no longer there. (“15.1. The Andre Norton Award for Outstanding Young Adult Science Fiction or Fantasy Book, established in 2006, is awarded in tandem with the Nebula Awards. This award shall follow all Nebula rules and procedures except as follows.”) However, other phrases in the rules, such as “The winners of the Nebula Awards, Bradbury Award, and Andre Norton Award shall be announced at an annual Nebula Awards ceremony” implied that the distinction still exists. Just got confirmation back from the higher ups at SFWA. Congratulations, you ARE a Nebula Award winning author. There it is, in black and white. (On my screen, anyway.) I am now a Nebula Award Winning Author! And so are Sam J. Miller, Fran Wilde, Alaya Dawn Johnson, Nalo Hopkinson, E.C. Myers, Delia Sherman, Terry Pratchett, Cat Valente, Ysabeau S. Wilce, J. K. Rowling, Justine Larbalestier, and Holly Black. Congratulations to them! 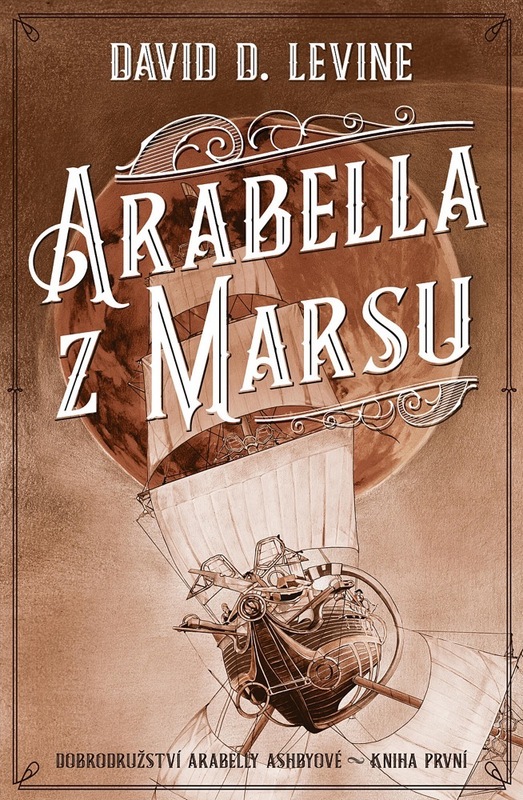 I published one thing this year: Arabella the Traitor Of Mars, the conclusion of the Adventures of Arabella Ashby trilogy. It hasn’t gotten a lot of critical attention, but many people have told me they think it’s the best of the three. And I would be remiss if I didn’t mention that the “Adventures of Arabella Ashby” series is eligible for the Best Series Hugo. 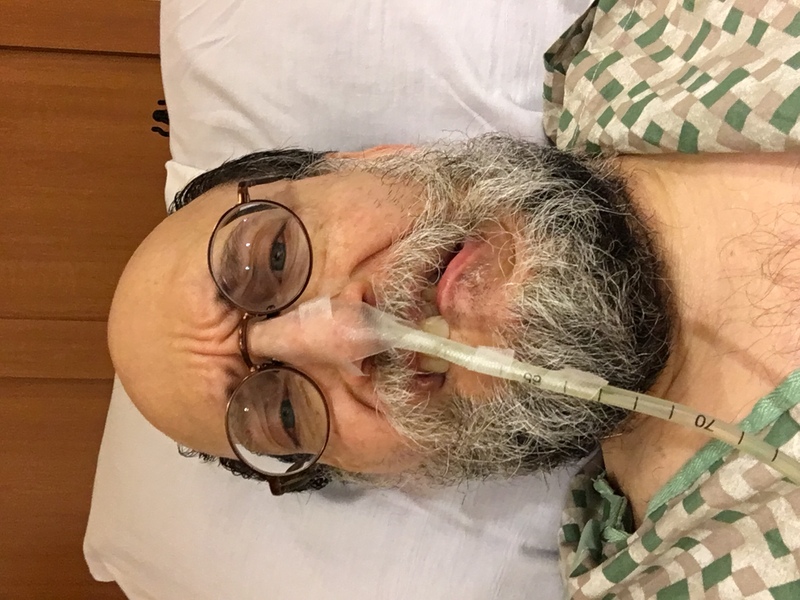 Well, I had surgery after all. We were hoping that wouldn’t be necessary, but it turned out that it was. We waited for four days for the blockage to clear by itself, but on Monday it became obvious that the tentative positive signs we had seen on Sunday were in fact only tentative. So I went right into surgery at 9:30am Monday. I do not remember the procedure at all. The last thing I remember was the anesthesiologist telling me he was going to give me something to calm me down. In the recovery room they told me the blockage was caused by a single band of scar tissue, so it was about as uncomplicated as could be. There’s no explanation where that scar tissue came from, though. And my guts were pretty angry from the blockage, so it’ll be at least several days until I can eat. Right now my pain is pretty well managed at a level 4-5 on a scale of 10. We have to wait for my intestines to start working again before I can go home, but I hope to start walking around today and that should help that happen. I’m still in room 833 at Providence Portland Medical Center on NE Glisan. Thank you all for your kind words and good wishes. Orycon is iffy but we’ll see. 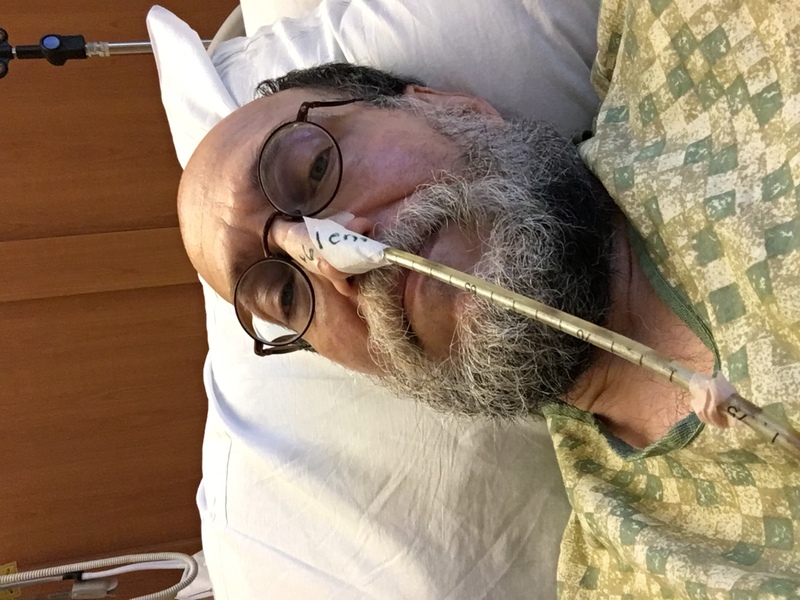 10-31-2018 at 06:54 AM Comments Off on Well, I had surgery after all. I had a lot of events planned this week and next — Scares & Squares, Charm City Spec, World Fantasy Con. Instead I am in the hospital. It started last Thursday night, with severe abdominal pain. I took myself to the emergency room about midnight and they admitted me in short order. I’m at Providence hospital on NE Glisan, room 833. I’m not very good company — I haven’t eaten or drunk anything in three days. I sleep a lot. But if you’d like to come by for a visit you’d be welcome. Join me for a live Google Hangout TODAY! 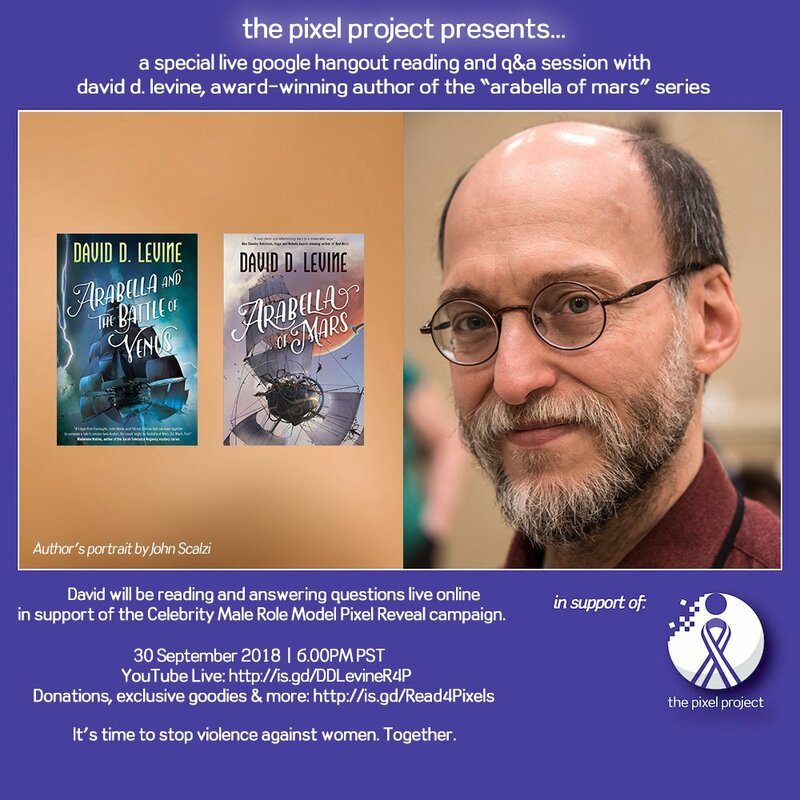 The “Read for Pixels” campaign features authors reading LIVE from their books and discussing why they support ending violence against women, their writing, and women in the media and popular culture. There will also be a live Q&A. 09-30-2018 at 10:53 AM Comments Off on Join me for a live Google Hangout TODAY! Puny humans! Quake in fear, for in the month of September you will not be able to avoid me! On Sep 4, 2018 in Portland, Oregon I will join Wendy Wagner in conversation at the Willamette Writers meeting. On Sep 6, 2018 in Chicago, Illinois I will appear at the Deep Dish reading series along with Mary Robinette Kowal, Mary Anne Mohanraj, Chris Bauer, Cathy Crocco, Steve Silver, Allison Manley, and host Niala Boodhoo. On Sep 8-9, 2018 I return to Portland, Oregon (what, did you believe that old saw about David never striking twice in the same place?) for Rose City Comic Con, at which I will be cosplaying as The Rocketeer and appearing on the panel Science Does Not Work That Way, Good Night, Volume 2!. On Sep 16, 2018 I’ll appear in San Francisco, California at the SF in SF reading series, along with Sheila Finch and possibly one other reader. And then, even if your city has escaped my personal devastation, on Sep 30, 2018 I will be doing a Read for Pixels Google Hangout online, which means everywhere! But even if you hide in the cellar, cut off your Internet, and move to the East Coast, you still won’t be safe! In October and November I will be coming to Montréal, Baltimore, and more Baltimore before returning to Portland. None shall escape! Bwah hah hah hah hah! Online interaction is the simple fact of Fannish activity today. It wasn’t always so. Some fans were early adopters of the Internet and its early alternatives. Some had to be dragged in. How did online fan activity get to be the way it is today? The long awaited reprint of Wild Cards VIII: One Eyed Jacks is August 28th. But you have an opportunity to get a copy while at Worldcon and to get autographs from many of the authors. This is a special group signing. Copies of the trade paperback will be available from Borderlands Books, in the Dealer’s area. The authors will ONLY be signing Wild Cards books. Who knew when Wild Cards was released in 1987 that it would grow to over 2 dozen books and still be going strong over 30 years later. The latest installments are Texas Hold ‘Em and Knaves Over Queens. The eighth book, One-Eyed Jacks, is being reprinted and released during the convention. Join the creators and authors for this discussion about how it all started, and where it’s going to be going. Your work is out there, and here come the reviews! What should writers know about reviews and how to handle them? Does the high of validation or the anxiety of public criticism ever go away? Let’s hear from a range of perspectives on how to deal with these feels. Announcing The Release Of Arabella the Traitor of Mars! 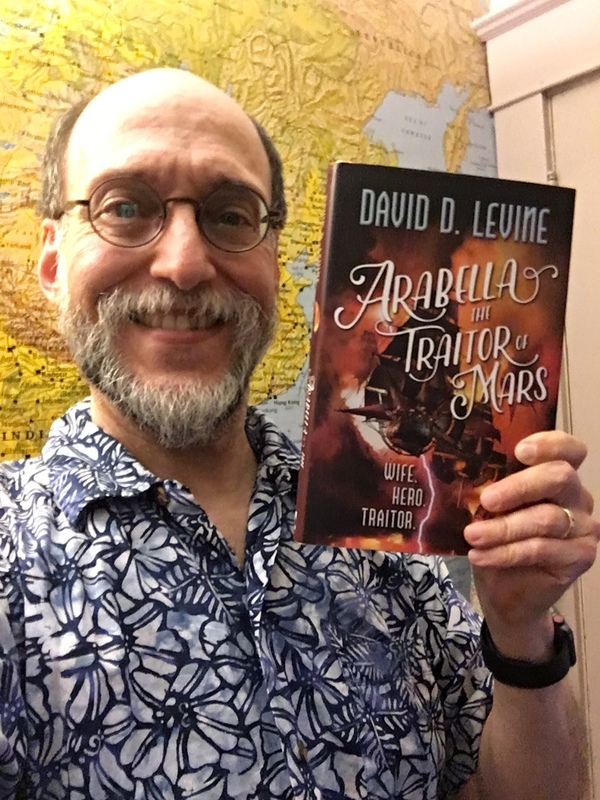 My third novel, Arabella the Traitor of Mars, the conclusion to the trilogy that began with the Andre Norton Award winning Arabella of Mars, comes out next week! The official release date is July 31. You can buy it from Powell's, University Book Store, Barnes & Noble, iBooks, Kobo, Your Local Independent Book Store, or Amazon. Is there an ebook? An audiobook? The ebook and audiobook of Arabella the Traitor of Mars should release simultaneously with the hardback, from all the major ebook vendors, without DRM. You can hear an excerpt of the audiobook here. It's narrated by the brilliant Barrie Kreinik, same as the previous two volumes. I haven't seen a preorder page for the audiobook yet, but it should appear soon. The previous volume, Arabella and the Battle of Venus, was recently released in trade paperback and is still available in hardback and all other formats. The hardback of Arabella of Mars is sold out in many places but the mass market paperback is still widely available, as are the ebook and audiobook. Are you planning a book tour? And there might be even more! Check my Upcoming Appearances page for updates. If any of these events is local to you, please come if you can. At the Powell's and University Bookstore readings next week I'll be appearing in costume and singing a new Hamilton-based song! From the publisher: Hail the conquering heroes! The tyrant, Napoleon, has been defeated with Arabella and the crew of the Diana leading the final charge. But, victory has come at a tremendous cost. Britain’s savior, Lord Nelson, has not survived the final battle and the good people of the Diana must now return to London as both heroes and pallbearers. At last husband and wife, Arabella and Captain Singh seem to have earned the attention of great men, ones who have new uses in mind for the Mars Company captain and his young wife. Both Company and Crown have decided that it is time to bring Mars into the folds of Empire, and they think Singh is the perfect man to do it. Now, Arabella must decide between staying loyal to the man she loves and the country of her father or betraying all that she has known to fight alongside the Martians in a hopeless resistance against the Galaxy’s last remaining superpower. You should buy the book, of course. Buying it on the release date is helpful but not necessary. If you can't buy it, borrow it from the library. If you can't find it at your local library or bookseller, ask them to carry the book. Also, it's extremely helpful if you post a review on Goodreads, Amazon, your own blog, or anywhere else people might see it. It's okay if you don't like the book! Even a negative review can be helpful if you say why you didn't like it. (Reviewer: "I hated this book! It has Martians and airships and girls dressing as boys! Yuck!" Reader: "Cool, that's just what I love!") And please mention the book to your friends online and off. Where should I buy the book? Is paper better than ebook? Wherever and in whatever format you like to buy books. I get the same money wherever you buy it, and I don't care whether you read it on paper or on screen. There are benefits to me if you buy it on Amazon, but personally I'd prefer it if you would support your local independent book store. Or you could get it from Powell's, which is my local independent book store. You can even order a signed edition from Powell's, which I will sign for you at my reading on August 1. Is this the last book for Arabella and her universe? It is, for now. I've been working in this universe almost exclusively for almost six years now and I think Arabella has done more than enough damage to her timeline—both of us deserve a rest. Since finishing Arabella the Traitor of Mars I have written an unrelated novella, a Wild Cards story, and a few other small projects, and I'm noodling on a new, completely unrelated novel which may or may not turn into a series. But right now, as you can see from my rather crowded travel schedule above, I'm spending more time on being an Author than being a writer. I hope to change that balance in the next few months. Thank you all for your support! I hope to see you somewhere in the next few months, and if not in person there's always social media.